When it comes to shopping for vintage watches on eBay, it can be a gold mine, or it can be a minefield. Our very own Christoph McNeill (you all might know him as Instagram’s @VintageDiver) wrote a must-read, common sense guide to buying vintage watches on eBay (check out Part 1 and Part 2). Today, we have another installment of eBay Finds, where Christoph highlights some great vintage gems looking for a new home on your wrist. Happy hunting! First up is this clean Seiko Lord Matic Ref. 5606 7010 from 1970. The Lord Matic line is a bit of a gem from Seiko. They’re generally inexpensive today, and for that money you’re getting a high level of design and finish. What’s especially nice about this one is the white “linen” dial that appears to be in near-perfect condition. The top-loading case, however, isn’t as clean and looks to have been polished a bit, but overall the watch doesn’t look overly fussed with. These calibers tend to have finicky date functions, but according to the seller this one is working just fine. They’ll even make a video for you before the watch ships out to show that it’s in working order. At the Buy It Now price, this one’s a steal. Then there’s this fantastic Seiko 5 Ref. 6119-7160 Sports diver with an original “razor” bracelet. This one shows a bit of patina to the lume, and there’s moderate wear on the case and bracelet finish, but overall it looks to be a good, honest example of a vintage Seiko diver that is, quite honestly, getting harder and harder to find for sale. 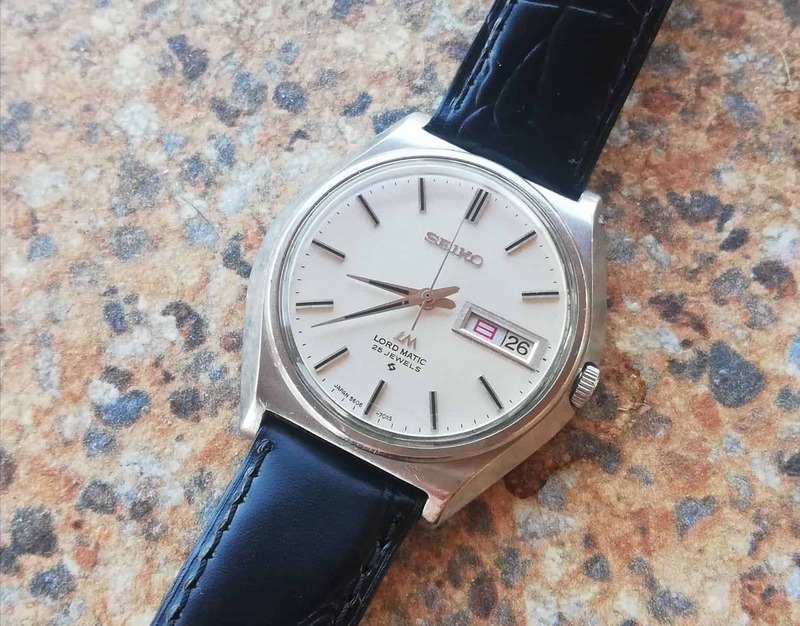 The seller states that this particular specimen is losing time so it sounds like it will need a service, but you pretty much need to count on that with any vintage watch, right? You want a chunk of 1970’s goodness? Look no further than this awesome Bulova Accutron Snorkel 666ft “Devil Diver.” Check out that great block case with the killer red and black acrylic bezel insert, and the whole setup complete with the original bracelet. This one runs on the legendary Accutron Cal. 218 tuning fork movement, which, according to the seller, is humming along nicely and keeping time. The black dial has a great patina on the lume and an otherwise clean dial. There’s a day/date window at three, and the original crystal even has the day/date magnifier! This is a great dive watch that rarely shows up in this condition, so it’s definitely worth taking a look at.